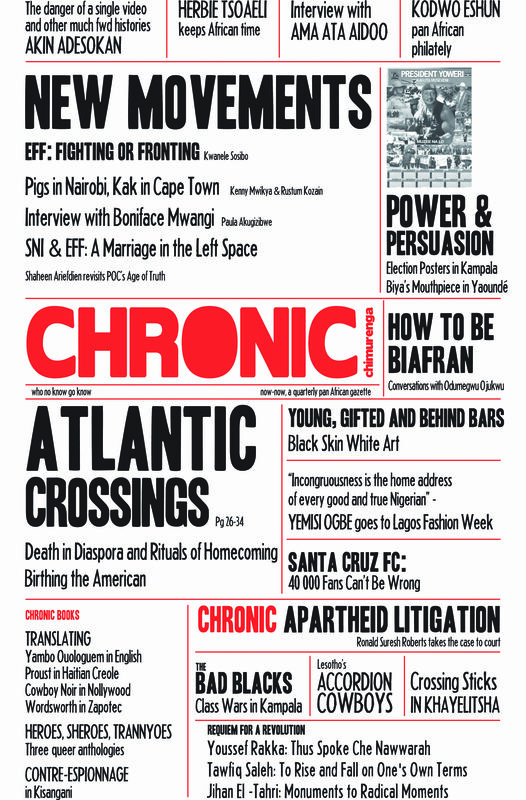 This edition of the Chronic, offers forays into interlaced subjects of power, resistance, protest, mobilisation, mobility and belonging. Marked by an urgency to unsettle divides between opportunism and opportunity, life and liberation, here and there, and then and now-now, the newspaper acts as a platform from which to engage the practices, dilemmas and possibilities of different world. Contributors include Kwanele Sosibo, Rustum Kozain, Boniface Mwangi, Paula Akugizibwe, Kangsen Wakai, Kodwo Eshun, Jihan El-Tahri, Mohannad Ghawanmeh, Youssef Rakha, Louis Chude-Sokei, Yemisi Ogbe, Florence Madenga, Ronald Suresh Roberts, Bongani Kona, Dudumalingani Mqombothi and Tseliso Monaheng.